Testing the Tagetes patula “French Marigold” in the same way as the first batch. 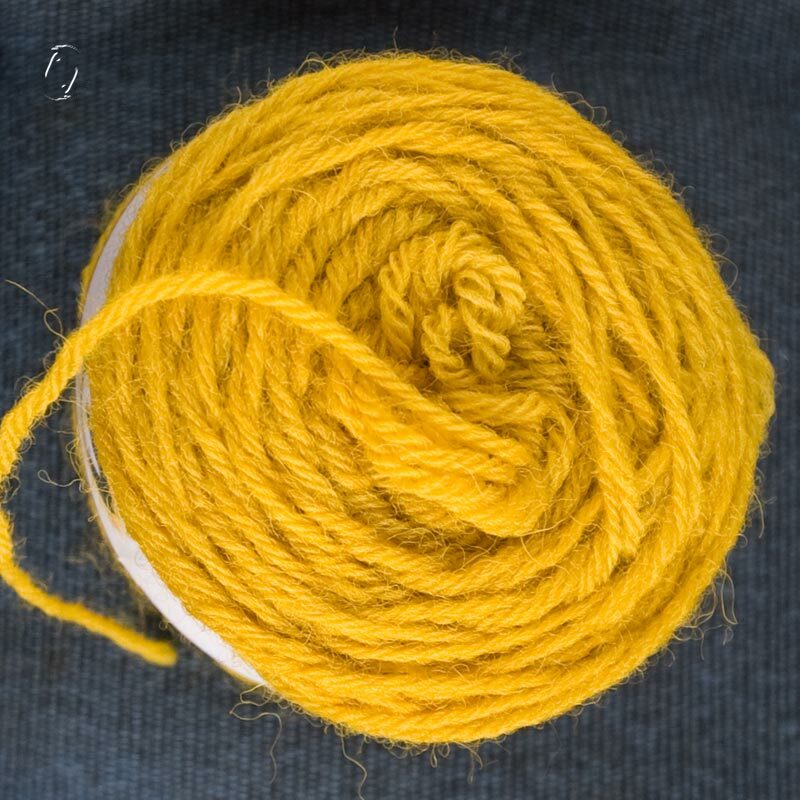 The dyebath was quite brown compared to the other tagetes, but in the end this skein also came out a strong yellow. They’re not completely the same hue, so this year I’ll probably continue testing them separately. Two years ago I also dyed with the same flower type and got 3 greens. I suspect that since one skein was copper mordanted, it simply poluted the dyebath, and not because the flowers or my method that year were any different. This is the reason I prefer modifying with iron and copper rather than mordant, even if I rinse the skeins well. But at least we know this dye can be modified, so I’ll be testing that as well. 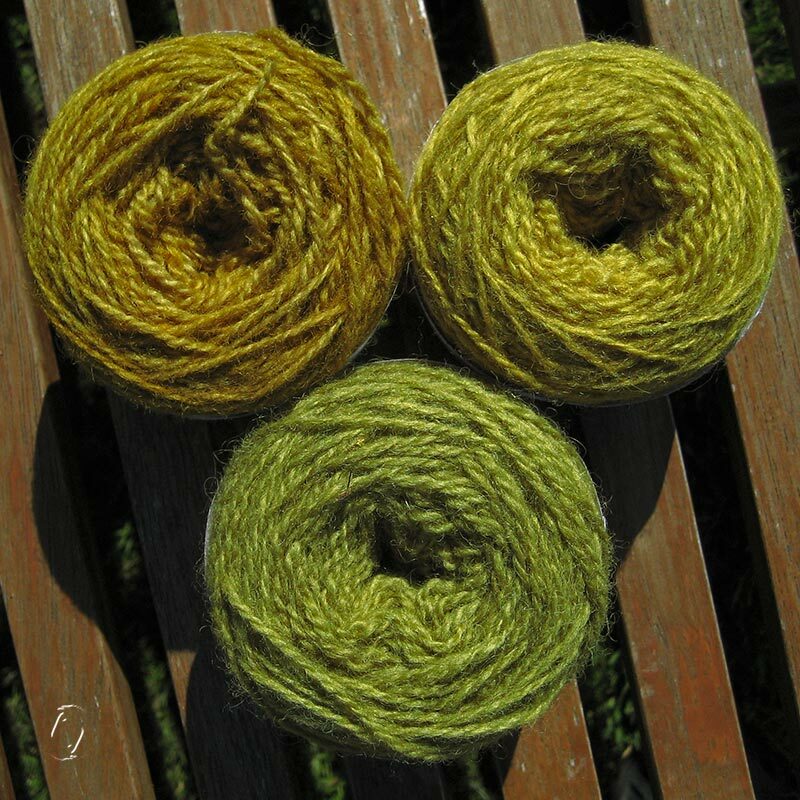 They may also become one of my choices for testing the rhubarb mordant vs. unmordant and alum in terms of colour and lightfastness. Samme test på denne tagetes som på den foregående, også med flot resultat. De tre grønne er fra forrige år, hvor det ene var kobberbejset, så jeg mistænker at det har “forurenet” hele farvebadet. Men det kan jo også være interessant. Jeg foretrækker dog at tilføje jern og kobber efter farvning, af samme årsag. 🙂 – I do enjoy when there’s lots of colour and pow, rather than all the drab ones that also happen. It’s like magic. We develop our own film in our kitchen, and that feels like magic too. I did that years and years ago!!! (80’s) Just b/w – totally awesome. Oh, we only do b/w too! But it’s exactly that, isn’t? Awesome. That’s a wonderfully vibrant yellow, and I do like those greens too, they’re absolutely lovely. I didn’t realise copper mordanted yarns can contaminate a dye bath that much. Up until now I have preferred to pre-mordant with copper rather than modify, because it creates less of a disposal problem (I keep reusing the same copper water over and over again, just adding more copper each time). So far I haven’t had a noticeable contamination problem, but now I am thinking maybe I need to re-think my method… or at least use a different pot for the copper mordanted wool when dyeing. Well, I’m not overruling that I may have “over-mordanted” – but it’s worth taking into consideration if things don’t go as expected. Especially perhaps with solar dyeing, where the yarn is in the liquid for days or weeks? 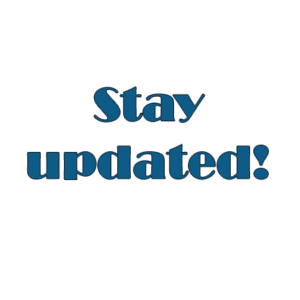 Q – Thanks for the heads up on copper mordant contamination! 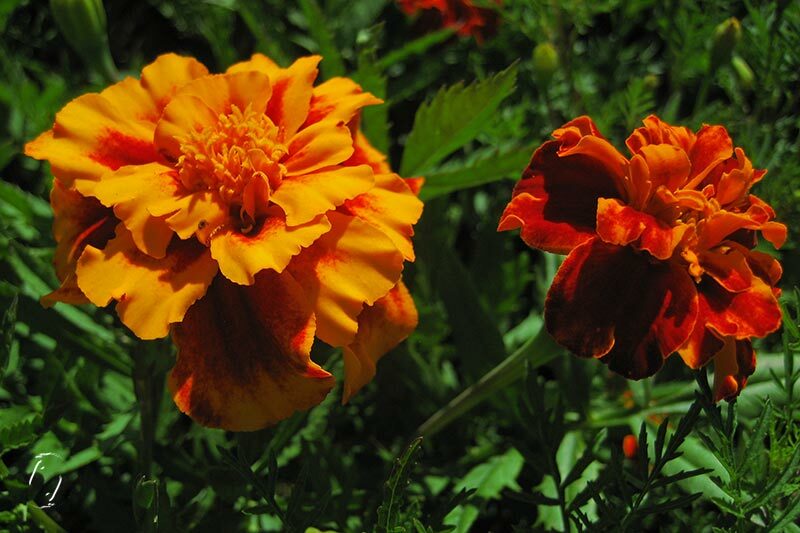 My marigolds are blooming and I should try this! Beautiful! ohhh I love those greens (even though they were a bit of an accident). That yellow is vibrant and joyfully so, even, but those greens are what I’d like wrap myself with, as a warm, oversized sweater. Lovely!!!! !